We are all familiar with user interactions and how they happen in mobile apps. A usual scenario looks like that: you tap on something clickable and an app takes you to another screen. Nothing new here. Don’t you think it’s a bit trite and someone needs to set a new trend? We got bored with typical UI/UX flow and created our own component called FlipViewPager. This component allows you to literally have three pages on one. We decided to play with user profiles, a typical thing for any social app which has a friends list. See the project on Dribbble and GitHub. All user profiles are organized in a custom list, which has left and right columns. When a user swipes left/right on one of the profiles, the component allows to see some information associated with this profile, such as interests, hobbies, jobs and so on. There is an idiom “read someone like a book” and this is exactly what our component does. By the way, all the folks you see on the screen are our guys from Yalantis. They all have made up names, though. The component was created by Dmitry Prudnikov, UI/UX designer, and implemented by Roman Herasymenko, our Android developer. Information associated with one profile. Information associated with the other profile. The FlipViewPager is based on a standard Android ViewPager component, which has a similar functionality to navigate between pages, but doesn’t know how to handle all challenges our component has to offer. Now let’s take a closer look at what we had to deal with. As I already mentioned, our component has one page divided into two rectangles - left and right. When a user swipes through one of these rectangles, we track the movement of a pointer. If the pointer moves along X axis, we lock the parent’s possibility to scroll the list and start our animation instead. We also calculate an angle at which we must turn a rectangle based on the pointer’s moving distance on the X axis. Since our list of profiles has two columns, and neither ListView nor GridView allows to implement this, we had to find another solution. How does the adapter for ListView work? 2. Then our adapter implements ViewHolder to make sure we create only a few FlipViewPager elements for visible items. 3. For each row in our ListView we built an instance of an internal secondary adapter called MergeAdapter. It receives two items to merge. 4. 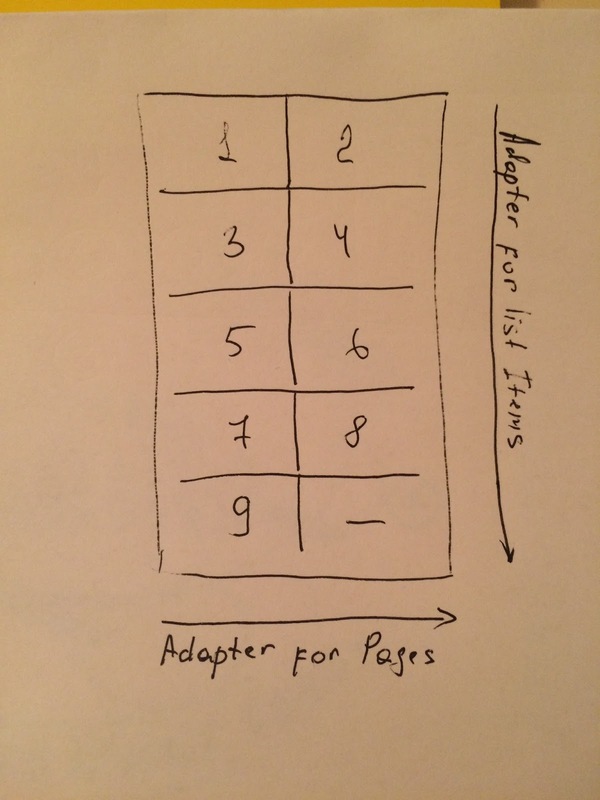 When it’s high time we rendered pages, our adapter calls an abstract method getPage(...) from the parent adapter. We extend BaseFlipAdapter and implement getPage(...). This method receives two items to merge in a single view, and to provide some additional pages with information for each of the items. ViewHolder for horizontal pages is implemented manually. As you can see, our FlipViewPager looks pretty cool! If you would like to use this library, you can design horizontal pages any way you like it. We can continue this list, but I guess you get the idea!